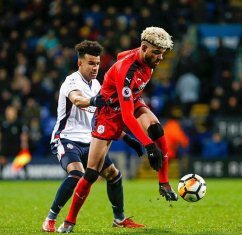 Huddersfield Town boss David Wagner is sweating on the fitness of Danish-born Nigerian midfielder Philip Billing, 22, ahead of their Premier League meeting with Liverpool on Saturday, October 20. The Terriers September Player of the Month was unable to play for Denmark's U21 national team against the Faroe Islands on Tuesday evening as he traveled back to England after picking up an injury while on international duty. Billing featured in Denmark U21s 1-1 draw with Poland in the U21 Euro qualifiers on October 12, and scored his maiden international goal against the Poles. ''Philip Billing is incapable of making tonight's important Under-21 international against the Faroe Islands,'' the Danish Football Association tweeted on Tuesday. "He has therefore returned to his English club, Huddersfield Town - we wish him a good recovery." This season, Billing has started all the eight matches played by Huddersfield in the Premier League, scoring his first goal in the English topflight against Everton in a 1-1 draw. Denmark U21s have qualified for the 2019 UEFA European Under-21 Championship after topping a group containing Poland, Finland, Georgia, Lithuania and Faroe Islands.